In part 1 of this series, I provided six general tips for teaching switchbacks, including how many, how often, how long, and how to use the music to help define your turns. In part 2, I will discuss five different scenarios for designing and cueing your switchbacks to make your classes more exciting and engaging, based on the idea that not every switchback is created equal. These different scenarios will allow you to vary what you do every time you teach switchbacks, increasing your coaching repertoire and improving your visualization and motivational skills as an instructor. In summary, try to employ a few different techniques each time you’re teaching switchbacks. 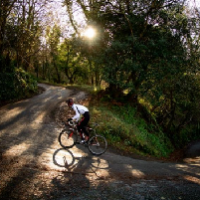 You can create an entire profile around an epic climb, create an interval ride based on climbing and devote one interval to switchbacks, or just use switchbacks as a drill anywhere in your profile. If you have video capabilities, it’s helpful to add some images of climbing switchbacks. You can find videos on YouTube, or Google any of the names of famous climbs I’ve mentioned above and click on images. My final recommendation, if you can avail yourself of it, is to put on your bucket list an experience of getting on a real bike and climbing a real mountain with switchbacks. It doesn’t need to be in Europe (though wouldn’t that be nice? ), but borrow a bike if you have to and find a road that doubles back on itself. You will immediately recognize how it can change everything!